If I can squeeze a quick update in here... today is a bit of a sad day for me as I have to let go and sell one of Neffi's beautiful kitties. One of the seal points is going today and the new owner is coming round later for him. Sad to let him go but happy that's he's going to a good home! Now to cheer up I have a rather pretty pink post for you today, in reviewing S&G's lovely 'Girligo' Moisturizing Mist. I was delighted to discover it has the same yummy fragrance as Hand Food - quite floral and sweet and fruity. It works just like one of those spray on suncreams so it's really easy to apply; just lift the cap and spray. The formula is really moisturizing - not quite living up to Hand Food - but leaves skin very soft and smelling sweet. aw i really love sopa & glory too. wish I could get everythingg :'D but I have loads of them at home yet. thanks for following. I follow back :) thank you! I have about three of these mists, they're so lovely! Hey just found your blog :) I've heard so many great things about the soap & glory products however I'm yet to try them! I also think the packaging looks really pretty haha. Can't beat abit of pink! 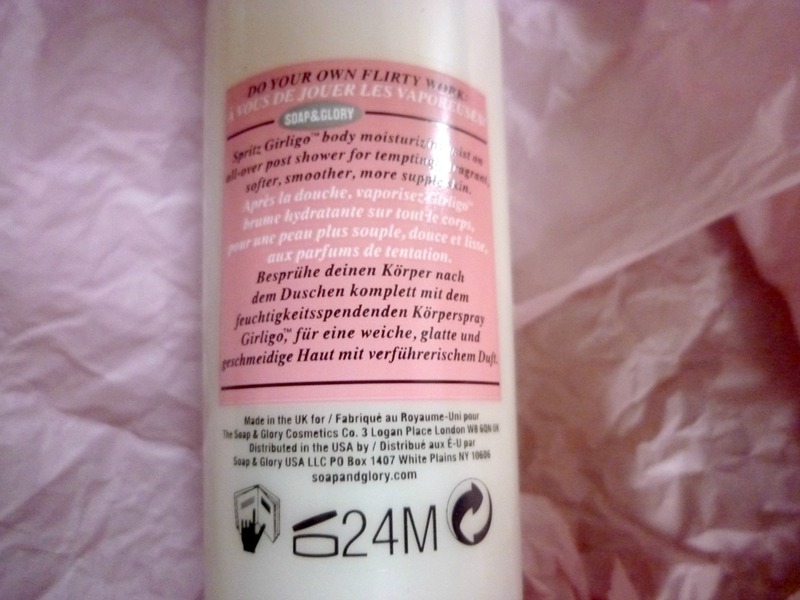 Hello :) I cant stop seeing soap and glory reviews but this one has definitely intrigued me. When I'm in the rush in the morning this would be great with its spray action! !